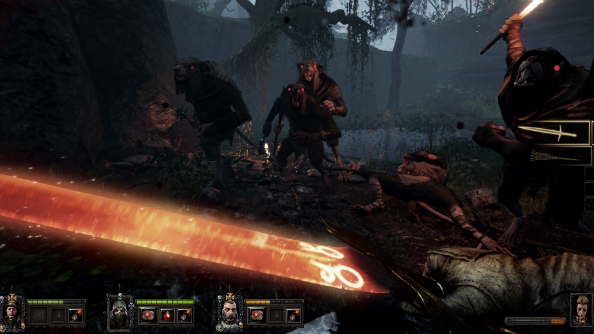 Warhammer: End Times – Vermintide’s final character trailer introduces Sienna Fuegonasus, who much prefers to go by The Bright Wizard. Sienna’s the joker of the pack, but bears a fiery temper when, say, hordes and hordes of rats appear and threaten to destroy all that is and all that once was. “The final Action Reel is of Sienna Fuegonasus – a fiery tempered Bright Wizard, always in search of a greater challenge, and a long time addict to the flames of magic. Blessed with a sharp intellect and a wicked sense of humour, Sienna will generally pass for a well-adjusted individual, in a very loose sense. She is a wizard after all. A bit of background: Sienna travelled from her native Estalia as a youngster when rumours began spreading that she was a witch. Eventually she made it to Altdorf, where she’d heard the wizards came from. Under the guidance of a Grey Wizard, Sienna studied at the college of the Bright Order, learning the skills you see in the trailer above. There’s a lot more character development – a surprising amount actually, for a game of this type – over at the offical site.